I don’t know how it happened. I didn’t mean to neglect my blog. I never made a conscious decision to abandon it. That doesn’t mean, however, that I didn’t make a choice. By not making it a priority, I chose to find other ways to fill the time. In other words, not deciding is its own decision. Today is the first day of Elul. It kicks off the intense training period leading up to the finish line at the conclusion of Yom Kippur. The marathon imagery makes sense to me. Just as one wouldn’t show up to the corral on the morning of the big race without having put in the mileage, so too does it behoove us to do the necessary soul work in order to make amends and to be open to forgiving others. There are many ways to get ready for these holy days. An essential part of my personal preparation is Preparing Your Heart for the High Holy Days by Rabbis Kerry Olitzky and Rachel Sabath. It resides on my nightstand throughout the month of Elul and straight through the ten days of repentance. Each night, I read through the text and reflection that corresponds to the coming day. Returning to this book year after year, I am always curious to see which passages resonate in new ways while others no longer hold the same connection. I also turn to music to help strip away the plaque-like hardness that has built up around my soul. Sometimes I sit for a long time with a single niggun to chip away at the stony barrier. Sometimes I listen to my High Holy Day playlist on Spotify. 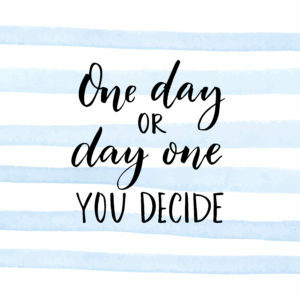 Find what works for you and then decide to do it. Today. This Day. Day One. #BlogElul is a monthlong exploration of themes pertaining to the High Holy Days. 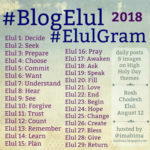 Created by R’ Phyllis Sommer, the #BlogElul #ElulGram project allows participants to delve into topics as a way of preparing for the season. Yes, I totally agree that not deciding is a decision. I have Rabbi Alan Lew’s book on my kindle and several different translations of Psalm 27. Thank you. It is a beautiful version.